One of my goals for 2013 was to add some modern touches to the kitchen. Do you have any art in your kitchen? I am in love with those sweet/salty prints for some reason! Maybe because I use those words to describe the moods of my children on a daily basis...they would be so perfect for my kitchen! Love this fun art...what are you going to choose???? My friend paints the most awesome pet portraits from photos if you'd like something unique....a whimsical painting of your fur babies perhaps?? I have one small painting that is really too small for the space it's in. My kitchen need loving details, too. I'll copy what you do. You know a dog painting pulls on my heart strings. I think I bright abstract sounds like fun too! We have a giant metal fork that I love for its simplicity. We used to have a framed photo of a coffee shop that we visited in Annapolis but that was taken down when we painted. I love the "sweet" and "salty" pieces and the retro ones. I see a DIY coming - you could do something really fun. What about a favorite recipe or family recipe done as subway art or something? Love this...last weekend I went to an estate sale...and saw something that would would be perfect...but I walked away without buying it. Ugh...now I'm seeing this and it's kinda killing me! I'm an artist and I have a lot of art in my house and kitchen. 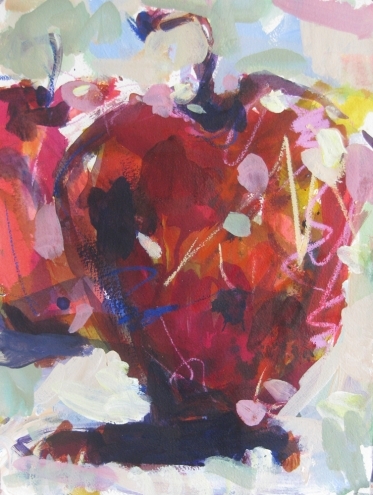 Before I started painting I collected original art by buying unframed at galleries or buying at art fairs. I still love the paintings I bought years ago. Now I have my own - a large tomato watercolor in the kitchen and a small painting of zinnias leaning against the counter wall covering wires and plugs. 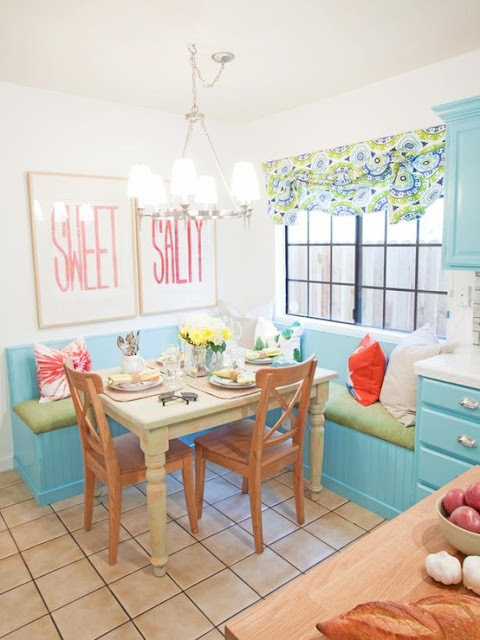 It can make the kitchen less sterile and welcoming. Go for original - it has class! Even if you do it yourself or frame children's art. Add some softness to the hardness of a kitchen. I have a large black and white photo of Frida Kahlo framed in purple and red (on red wallpaper), a black and white photo of my me and my family at Horsetail Falls in Mexico, a small signed street scene print from Germany that came from a now defunct Mexico City museum and another signed print from one of my bestest friends. Plus a chalkboard/blackboard for a little traditional kitchen decor. 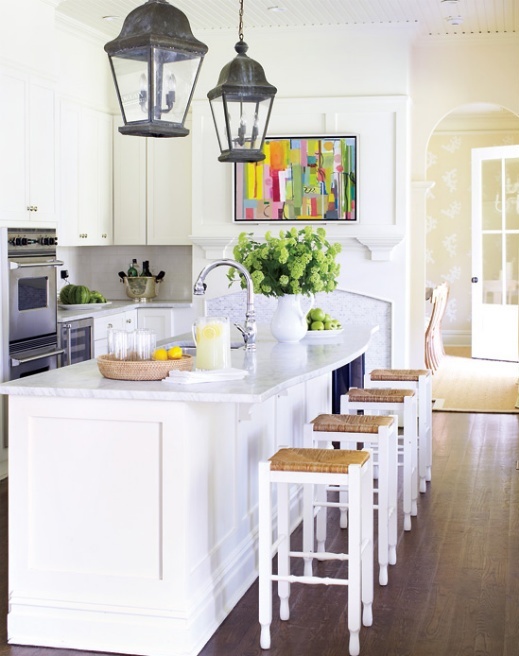 the bright abstract is gorgeous but maybe it's really the kitchen I'm loving. Hmmm. Anyways, no art work in my kitchen, no wall space for it. Great picks though, so many different ways you can go. 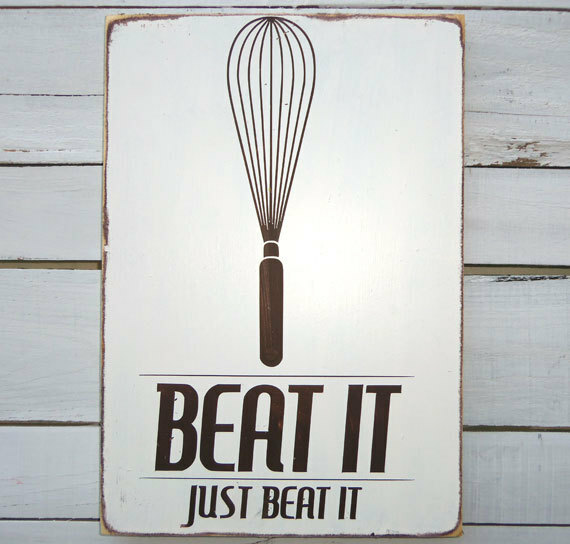 The signs in your kitchen are fantastic. 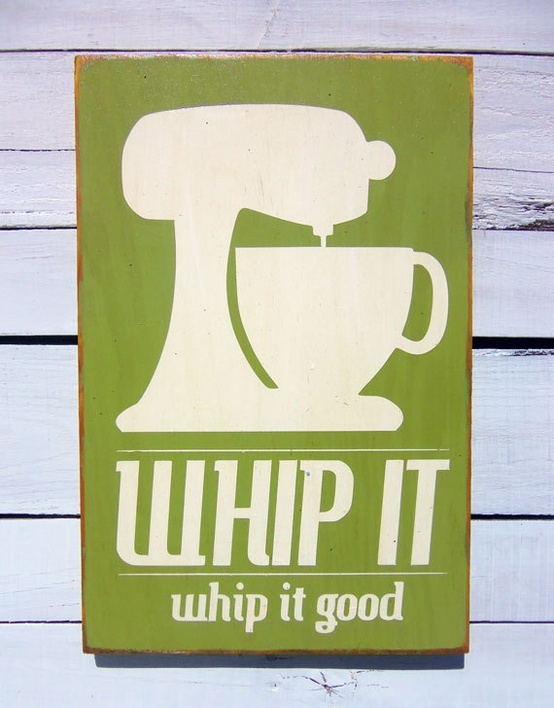 I love the sweet and salty as well as beat it and whip it. I am planning an outdoor kitchen on our deck this spring and should add a couple of cool signs like these to jazz it up. I love artwork in the kitchen, we have a watercolor landscape over our bar sink and a reverse painted Italian mirror on the wall adjacent. Adds interest when there is so much cabinetry. You just inspired a post about some dog art we have! Yep:) ..just a little. I don't have much wall space. I also like the look for a print, picture sitting up against the backsplash. How about commissioning a painting of Rio? Nothing could be cuter than that! Love the sweet and salty....may have to DIY! 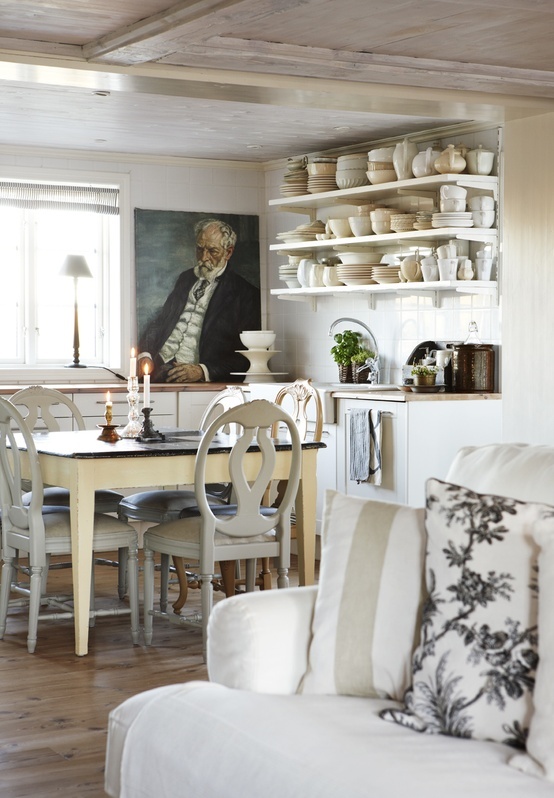 Art in the kitchen is as important as any other room! Have a wall, hug wall, that's when I asked MC to build the built-ins. Didn't have the correct "Art" to fill such a large space. I then hung two pictures on the inside frame! We also framed pictures of European mansions from an old calendar and "hung" them on the back splash! Love the look. We are currently in the process of redoing our kitchen... shhhh my husband doesn't know this yet. ha ha! This time I am using original artwork (either mine or thrift store/art show finds) and doing some fun tile work with all the mis-matched pieces of tile I've been saving for a rainy day. (Seriously $5 for a rubbermaid tote full of odds and ends.... some broken but some in good condition... may as well use it!) 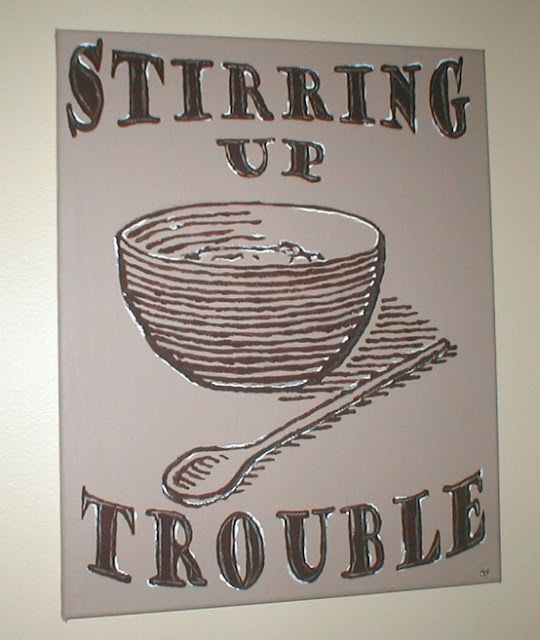 And as far as what type of artwork.... yep still shooting for original, it would look great in your kitchen! Have a wonderful day! My favorite is the entire setting for the sweet and salty picture. I would love to have that as part of my home. All great ideas! Love how graphic they are! Now don't take this the wrong way but years ago when we visited San Francisco we purchased a photo of a straw basket with bottles of wine in it. It's actually quite lovely and just says it all. So my style to want an unusual piece of art in a room that is not expected. 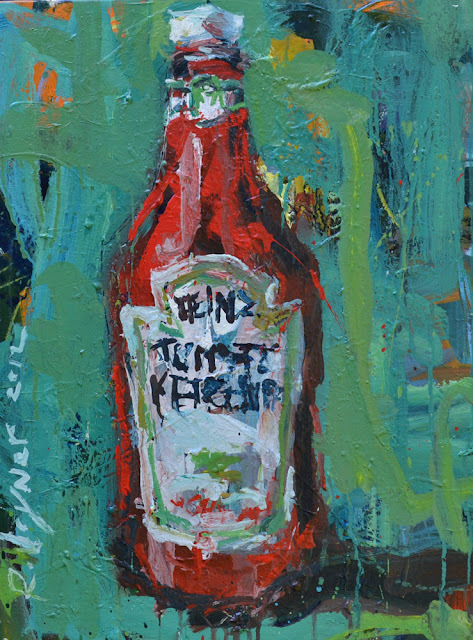 Love the portrait and the ketchup bottle paintings. The last two are great! I would smile every time I see them! :) Looking forward to seeing what you add. 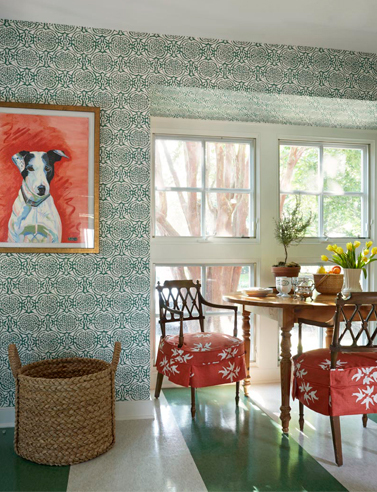 Oooh, I love the dog portrait and the antique one. I think my boys would love the ketchup! Have a lovely weekend, Pam! I went to Nashville with a bunch of friends and ended up in the Hatch Show Prints shop downtown. They've been making concert posters for years and years and years. I bought a print of a pot of coffee in black, white and red and framed it in a black frame with a red and white gingham border. It hangs above my stove. All told, the project cost me less than $20. I just have to have those sweet and salty prints. Where can I purchase them? Hi Holly - Aren't those prints fun?!! I'm not sure where you could find them, maybe Etsy? I did see some on Pinterest, but they were a bit different. Good luck!